TGIF! And I heard there was some kind of wedding going on today, is that true? That’s how out-of-touch I’ve been this week with so much going on at work. Not fun! 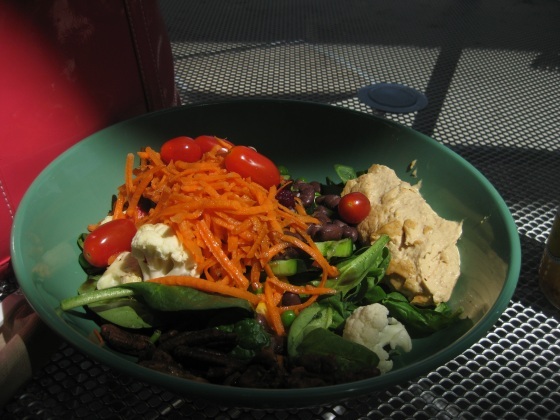 But I did break away to Whole Foods for a nice lunch while enjoying our nice weather. 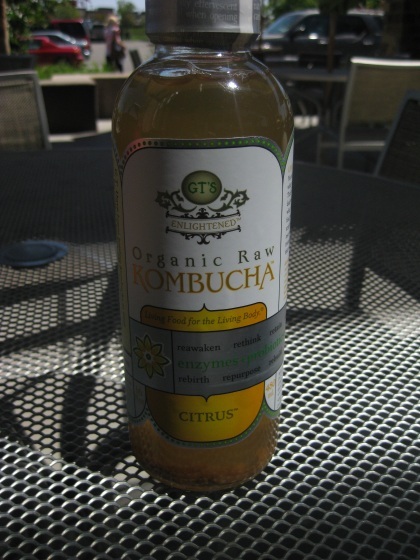 The citrus was pretty good, a little tart and bright without being sour. After work I had some time to kill before meeting hubby and some friends for dinner and browsed DSW. 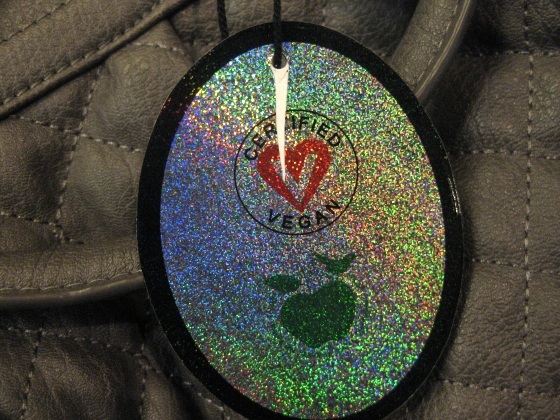 I managed to stay out of trouble, but noticed this label on many of the purses there. 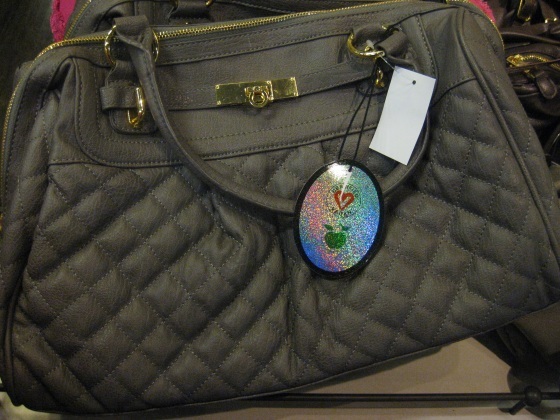 DSW carries Urban Expressions vegan handbags and they reasonably priced between $30 – $60. I was very temped to pick up this one in a light beige for summer, but behaved myself. :-P Maybe next week. 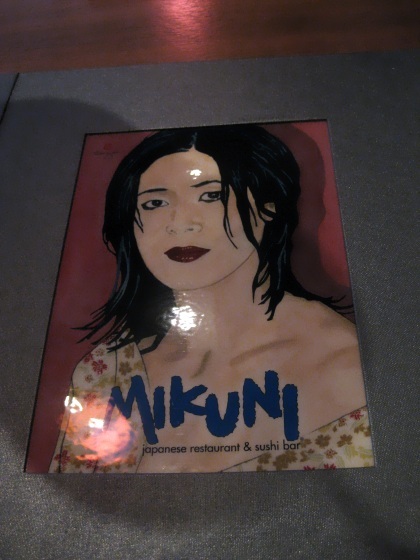 Then I stepped over to Mikuni’s newest location to meet the gang for dinner. Starting with one of my favorite appetizers. 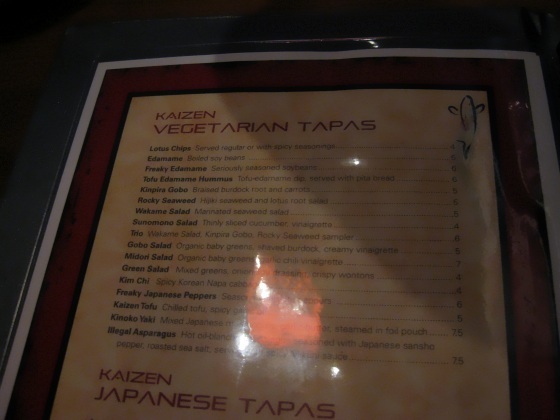 I was very impressed with the vegan options in the menu, lots to choose from with traditional dishes like seaweed salad and edamame to tofu hummus and spicy asparagus. 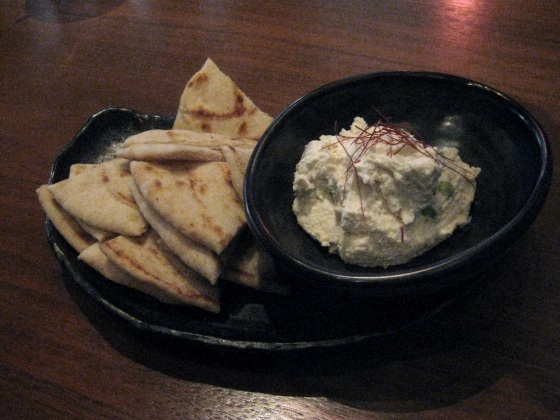 I had to try the tofu edamame hummus next and wow! It was like a savory, whipped cream cheese with a miso/soy kick! It wasn’t an appetizer I’d expect at a Japanese sushi place, but it was a fabulous fusion blend with flat bread. Sushi was probably the hardest thing to give up when I went vegan because most vegan sushi rolls are weak usually being just cucumber and/or avocado wrapped up like sushi, hardly exciting. 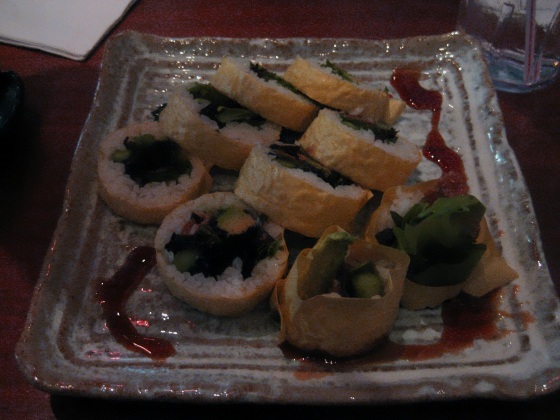 But the Rabbit Roll ranks up there as being one of the most exciting vegan sushi rolls I’ve ever had. 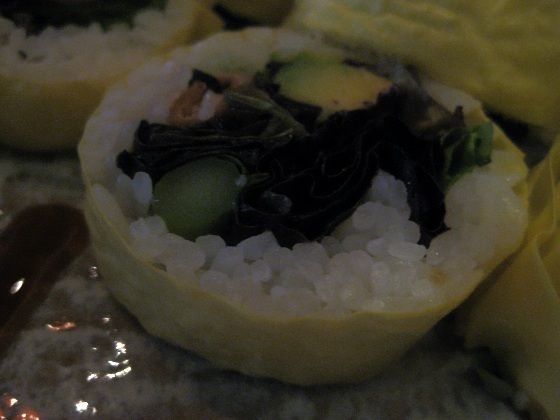 It was stuffed with greens, asparagus, avocado, fried soy strips and wrapped in a non-traditional soy wrapper that lightened up the flavors and texture compared to saltier nori wraps. 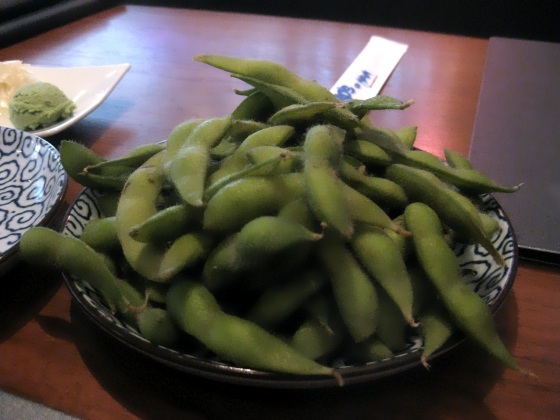 What a wonderful way to kick off the weekend, I’m thrilled that Mikuni’s added another location to the Sacramento area and plan to make many more trips to try the rest of the vegan options. I like the name of the Rabbit roll! So awesome, and sounds yummy! the rabbit roll looks amazing! you’re right usually vegan sushi is just avo, cukes, rice…boring as sushi goes. love the rabbit roll.